Instant suggestions for trades that will benefit your team. See the odds of each trade offer being accepted. 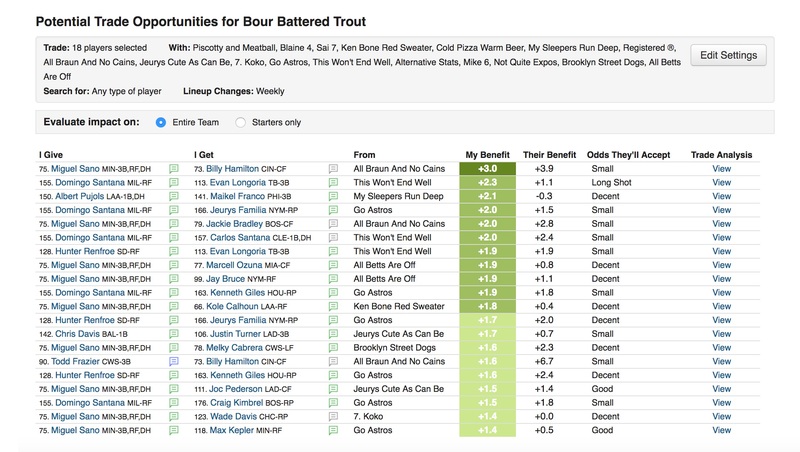 Analyze a trade's impact on each team’s stats and starting lineups. View projected stats for all players involved in the trade. Get a breakdown of how each trade affects the talent and depth of your bench. How do I get the Trade Finder? The Trade Finder is part of the premium package for My Playbook. This package also features support for custom scoring and multiple league imports along with additional tools to help you dominate your fantasy baseball league: a Lineup Assistant, League Analyzer, Trade Analyzer, Waiver Assistant, and Research Assistant. Can I pick which teams I'm willing to trade with? Yes, the Trade Finder is fully customizable. As well as picking which teams in your league you’re willing to deal with, you can also isolate positions of need that you want the Trade Finder to focus on, or specify players you want to move or keep.